Writer Sam Cook. Credit: Marie Zhuikov. A dawn wind stirs on the great marsh. With almost imperceptible slowness it rolls a bank of fog across the wide morass. Like the white ghost of a glacier the mists advance, riding over phalanxes of tamarack, sliding across bogmeadows heavy with dew. A single silence hangs on the horizon. Out of some far recess of the sky a tinkling of little bells falls soft upon the listening land. Then again silence. Now comes a baying of some sweet-throated hound, soon the clamor of a responding pack. Then a far clear blast of hunting horns, out of the sky into the fog. High horns, low horns, silence, and finally a pandemonium of trumpets, rattles, croaks, and cries that almost shakes the bog with its nearness, but without yet disclosing whence it comes. At last a glint of sun reveals the approach of a great echelon of birds. On motionless wing they emerge from the lifting mists, sweep a final arc of sky, and settle in clangorous descending spirals to their feeding grounds. A new day has begun on the crane marsh. “Sometimes it makes you depressed to read really good writing,” Sam said. However, I suspect he was moved by Leopold’s writing, and just wanted to hide how sentimental he truly is. Sam is a noted book author and outdoors writer for the Duluth News Tribune. 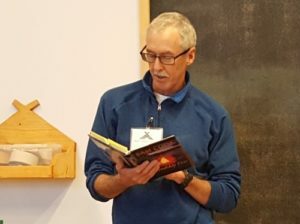 I attended his workshop last month at the North House Folk School along the shores of Lake Superior in Grand Marais, Minnesota. When Sam teared up, he was talking to us about the power of details in writing and how they can draw a reader into your story. Other writers he quoted from included Leif Enger, Barry Lopez, John McPhee and Dennis Olson. I won’t give away all of Sam’s secrets, but I would like to share a few bullet points from his class that would-be writers might find useful. Good writing makes people feel like they’re in the experience with the author. Incorporate all the senses into your writing (taste, touch, smell, etc.) Be a sponge, soak it all in when you’re gathering information. Read your story aloud during the editing process to smooth out awkward wording. Sam passed around a stack of his reporter’s notebooks to show us how he processes information for his stories. He also read from his own works, notably, a story about how he – a Kanas native – became a true northerner by sticking his tongue on metal in the middle of winter. He also read a poignant column about his wife’s recent health scare. I learned new ideas for writing story openings from Sam. If you ever get a chance to take a class from him, don’t miss it! This entry was tagged Sam Cook, scicomm, science communication. Bookmark the permalink.